Shari & Neil got married at Blackstock Country Estate near Hailsham, East Sussex. They wanted their guests to have an individual cake each plus a cutting cake. Their colour theme was ivory, burgundy and orange. 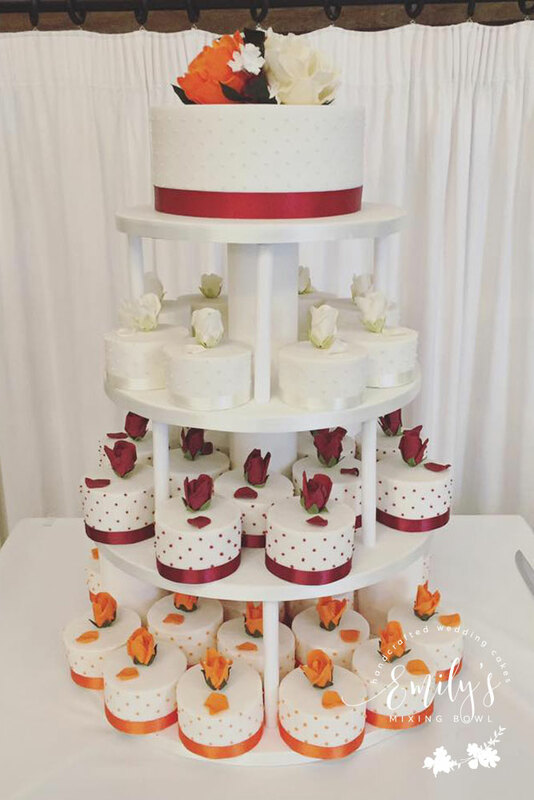 I made 80 individual cutting cakes for them with small sugar roses on top of each one and hand piped dots. The cutting cake was to match with the 3 coloured roses in a larger version. Serves 80 (each cake is big enough to serve 2-4 so could serve 320!) plus 40 finger portions with cutting cake.